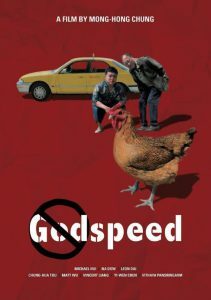 Set for wide release in Taiwan on November 18, 2016, Godspeed (一路順風) is a dark comedy about a drug mule who takes a ride with the wrong taxi driver. Directed by Chung Mong-hong (鍾孟宏), the film stars veteran Taiwanese actor Leon Dai (戴立忍), TV host Na Dou (納豆), and Hong Kong comedy star Michael Hui (許冠文) in its lead roles. The film’s English festival poster. Even before reaching general audiences, Godspeed has already screened at the Toronto International Film Festival and been nominated for eight different Golden Horse Awards (Taiwan’s Oscars), the most for any film this year. Given the film’s dark subjectt matter and the fact that Leon Dai was recently booted from a Chinese film for having an “ambiguous” stance towards Taiwan independence, this will make for an interesting awards ceremony, one that probably won’t be publicized too heavily in mainland China. Godspeed runs for 1hr 51min and has dialog in Mandarin as well as limited Taiwanese and Thai.